Bullying affects everyone who’s involved. Children who are involved experience mental health issues, physical symptoms, and poor school performance. You can help your child recognize the signs of bullying. Children often don’t understand when someone is being bullied. They may feel someone is joking or may not understand social norms. 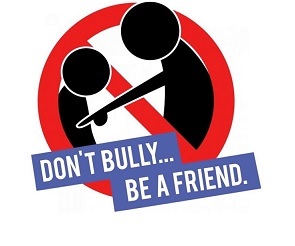 Children should be informed of the differences between friendly behaviors and bullying behaviors. When talking to children about bullying parents should listen, react in ways to encourage trust from the child, be supportive, be patient, provide information that the child can understand, and discuss options for dealing with the bullying behavior. When discussing bullying with a child use open-ended questions. Let them know they are not alone. Bullying happens to a lot of kids but it is never right for a child to be bullied. Parents, children, schools, and the community play a role in bullying prevention. We should all work together to prevent bullying. Learn more at Pacer: Bullying.